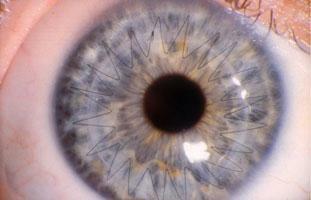 Corneal Collagen Crosslinking (CXL) is a procedure used to treat keratoconus. This minimally invasive procedure involves applying liquid riboflavin onto the surface of the cornea, then treating the eye with ultraviolet light, eliminating cornea ectasia. This procedure can be combined with other keratoconus treatments. For example, many patients will combine CXL with Intacs, which are tiny arc-shaped corneal inserts designed to stabilize the cornea. The CXL procedure is most effective when it can be performed before the cornea has become too irregular in shape, or before there is significant vision loss. Applied early, CXL will generally stabilize or improve the shape of the cornea, resulting in better visual acuity and better results with contacts. Before you can undergo the procedure, you will come in for your consultation to make sure you are a good candidate for CXL. You will also have a routine eye exam to assess your visual acuity. Our doctors at Berg Feinfield will map your cornea to determine the level of your eye condition. The procedure itself takes about 60 to 90 minutes. Depending on the type of corneal crosslinking you receive, the procedure will be slightly different. Your doctor will decide beforehand which type will be most beneficial to you. Set up your corneal crosslinking consultation with Berg-Feinfield in Beverly Hills, Los Angeles, Burbank & more today!